No it's not called Dhoop. 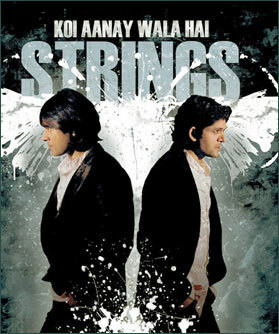 The next Strings album is tantalizingly called Koi Aanay Wala Hai. It's an apt name for the most anticipated album of the year. Strings, as one music aficionado put it recently now fall into the category of "classic". This Strings fan is well into his 50s. With their melody, lyrics by Anwar Maqsood and a signature style that they have never veered from, Strings have become a listening habit in Pakistan. And they've penetrated so deep into our consciousness that they're not going anywhere. If Ali Azmat is about radical experimentation and newcomer Atif is all about hype, Strings are all about consistency and a mellow attitude that they have made uniquely their own. They are not about 'Garaj Baras' and are definitely not scratching their heads and wondering 'Hum Kis Gali Jaa Rahe Hain'? Faisal Kapadia and Bilal Maqsood are self assured, co-pilots of the enterprise that is the Strings and they're cruising along hitting all the right notes and that too all over the sub-continent! Faisal Kapadia and Bilal Maqsood have long been the most chilled out guys in the music industry. They occupy their own world. Both are happily married to the women they fell in love with years ago and have children; Bilal, three and Faisal, two. And they have never been into making statements. They don't take up political causes. They will do a 'Beirut' but they won't tom-tom the fact all over the place. They do what they do and they do it well, but they do it very quietly, so at the end of it, all you hear is the music. Faisal and Bilal are voyeurs. They observe the milieu and resolutely figure out a way of doing their thing their way. Sitting with them in Bilal's gorgeous home within the Maqsood family compound in Defence Karachi, the vibe is easy to pick up on. There is a sense of calm to both of them. They share an easy energy, as mellow as the music they make. They are both excited about their new album, which is being mastered at Yashraj Studios in India, in the heart of Bollywood itself and yet the sound is distinctly Strings. 'Koi Aanay Wala Hai', the song starts off from where the excellent 'Aakhri Alvida' left off. This album sees a reinvention of the Strings. There are breaks between rhythm and melodic bridges that reach to a crescendo and then goes around for another spin. It's a definite departure from Duur and Dhaani. The music is more rocking, the sound is definitely edgier, but it doesn't sound like a whole new band. Faisal and Bilal know the Strings signature well and they stick to it.